Sen. Pat Roberts takes the stage to make his victory speech Tuesday in Overland Park, Kansas. One of the most universal lessons of sports prediction is that margins matter. An NFL team that wins a number of games by less than a touchdown might get banner headlines for its clutch performance. But a team’s record in close games is mostly just luck. A football team that thrives on winning close games is likely to see its luck revert to the mean and start losing its fair share of them. The same is true in baseball, basketball and most other sports. In fact, at least in my experience, this is close to being a universal maxim for statistical prediction of all kinds: Mind the margin. Oftentimes, we’re interested in some binary outcome. Does the team win the game? Does the Democrat win the election? Do the floodwaters breach the levees? But those binary outcomes result from some continuous variable: The floodwaters breach the levees at 60 feet but not at 59. When building a model around historical data, you’ll almost always make better forecasts by looking at the continuous variable instead of the binary one. Close calls count. Like the NFL team that keeps winning games by a field goal, the levee that is at the brink of being topped during every hurricane is likely to fail sooner or later. So, while Republican incumbent senators have gotten some credit lately for their clutch performances in Kansas, Mississippi and other states, where they’ve fended off challenges from more conservative opponents, the GOP still has plenty to worry about. 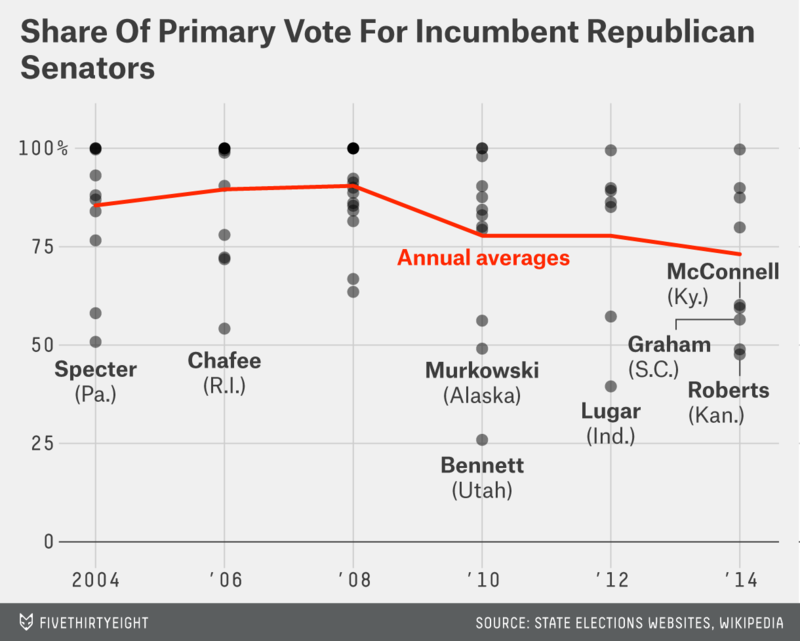 There have been far more close calls to its incumbents than usual. Kansas Sen. Pat Roberts, for instance, won just 48 percent of the vote Tuesday in defeating Milton Wolf, a radiologist with no prior experience running for elected office. Mississippi’s Thad Cochran initially placed second against Chris McDaniel, a state senator, before barely winning the runoff election, in part because of votes from African-American Democrats. Sen. Mitch McConnell’s win in Kentucky in May, where he got 60 percent of the vote to challenger Matt Bevin’s 35 percent, was more emphatic. Still, it was much closer than Senate primaries normally are. Between 2004 and 2008, just four of 39 Republican senators running for renomination, or 10 percent of them, got less than 65 percent of the primary vote. This year, five of 10 have fallen below that threshold: not only Roberts, Cochran and McConnell, but also Lindsey Graham of South Carolina and John Cornyn of Texas, who both benefited from running against divided fields. In fact, the average share of the primary vote received by Republican incumbent senators so far this year is 73 percent. Not only is that lower than 2004 through 2008, when incumbents averaged 89 percent of the vote — it’s also lower than 2010 and 2012, the years when the tea party was supposedly in ascendency, when GOP incumbents got an average of 78 percent. So, though this year’s primary season is almost over — on Thursday, Tennessee’s Lamar Alexander will be the last Republican incumbent to face a competitive primary — there’s no evidence the threat from primary challenges has been reduced going forward. It may even still be increasing. Beware of mainstream media narratives that state the contrary; they often draw too many conclusions from idiosyncratic results or fail to appreciate the differences between primaries and general elections.